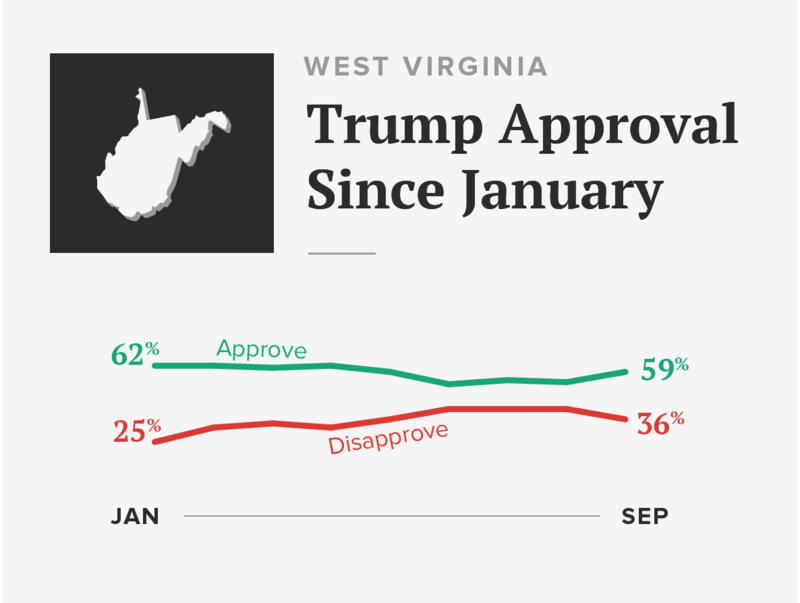 At the beginning of Trump’s term, 62 percent of registered voters in the Republican stronghold of West Virginia approved of the president, while 25 percent disapproved, according to Morning Consult polling data. That wasn’t too far off the Mountain State’s 2016 election returns, when Trump cruised to victory with 69 percent of the vote, compared with 26 percent for Democratic rival Hillary Clinton. Morning Consult surveyed 472,032 registered voters across the United States from Jan. 20 through Sept. 26, asking whether respondents approved or disapproved of the job Trump is doing as president. The survey was conducted online, and data were weighted to approximate a target sample of registered voters based on age, race/ethnicity, gender, educational attainment and region. The survey’s margin of error in West Virginia is plus or minus 5 percentage points. Some West Virginia voters said in interviews that things aren’t changing quickly enough in a state that has an 18 percent poverty rate and has become the face of the nationwide opioid epidemic, with the highest drug overdose death rate in 2015. Tom Kramer, a bartender and waiter from Kearneysville, said his son’s five-year battle with prescription drug abuse was almost inevitable. In West Virginia, he said, “these kids have nothing better to do.” Kramer, 53, said he has seen little action from the Trump administration to address the issue. In July, the President’s Commission on Combating Drug Addiction and the Opioid Crisis issued a preliminary report urging Trump to declare opioid abuse a national emergency. He hasn’t done so, but a White House spokesman said the administration has taken several steps to address opioids and drug addiction, including state-specific outreach, hosting an opioid crisis roundtable at the White House and collaborating with law enforcement. But that’s not the only concern for Kramer, who said repealing Obamacare, a key Trump talking point, would hurt West Virginians. The president’s plans “just make the poor get poorer” in West Virginia, said Kramer, who indicated he would not vote for Trump if he runs again in 2020. I’m more free trade than Trump, but at least he’s aggressive and competes, instead of just giving everything away. Blaine Simpson, a 52-year-old information technology consultant from Summit Point, W.Va.
Trump’s drop in overall approval in West Virginia came as a surprise to Hoppy Kercheval, a broadcaster and political commentator in Morgantown, who estimates he meets three Trump supporters in the state for every one detractor. Kercheval attributed the decline in support to the absence of voters who were motivated last November more by their opposition to Clinton than their enthusiasm for Trump, noting that almost 70 percent support would be difficult to sustain for any candidate. Overall, though, West Virginia carries relatively strong Trump support — tied with Alabama for seconded highest in the country as of September — from a base that continues to be impressed with Trump’s protectionist trade stances, staunch defense of the coal industry and brash talk about foreign foes. Larry Whetsell, a 62-year-old U.S. Army veteran and town councilman from Bolivar who voted for Trump, said the president’s call for harsh sanctions and potential military action against North Korea project a powerful image to the rest of the world. Blaine Simpson, a 52-year-old information technology consultant from Summit Point, said he would support Trump for a second term, unless a more libertarian candidate emerges. “I’m more free trade than Trump, but at least he’s aggressive and competes, instead of just giving everything away,” Simpson said. Trump has a stronger and longer grip on West Virginia because it is one of the few states to have seen an-almost immediate return on the president’s campaign rhetoric to prop up the coal industry, a cornerstone of the state’s economy and culture, according to John Deskins, an economics professor at at West Virginia University who pointed to Trump’s announcement that the United States would withdraw from the 2015 Paris climate change deal. West Virginia’s coal mine output dropped from more than 157 million tons in 2008 to 80 million tons in 2016. This year, output is projected to exceed 88 million tons, according to a report co-authored by Deskins. The 11 percent increase during Trump’s first year in office compared with the last year of the Obama administration is not lost on West Virginians. But those concerns weren’t echoed in interviews with voters across the Potomac River in Maryland, one of the nation’s most liberal states. Trump’s 38 percent approval rate in January there slid to 33 percent in September, while his disapproval rate jumped from 51 percent to 62 percent during the same time period. The Maryland survey has a margin of error of plus or minus 4 percentage points. Barry Marcelus, a 38-year-old teacher from Baltimore, said Trump squandered chances to unify the country by instead embracing exclusivity and surrounding himself with divisive figures such as former White House chief strategist Steve Bannon, who has since returned to Breitbart News as executive chairman. Marcelus added that Trump is “in over his head” because he doesn’t have any previous governing experience. 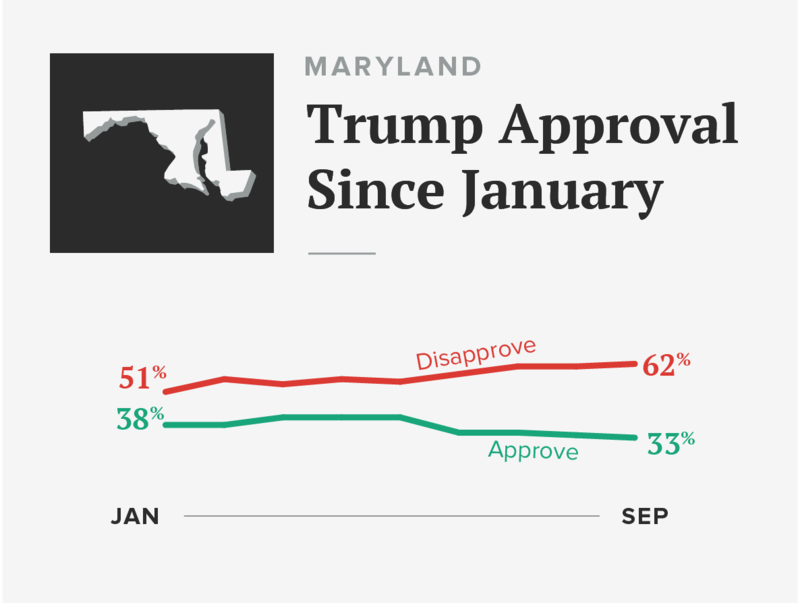 But Trump voters in Maryland say the president isn’t being given a fair shake in the media or by the Democratic voting majority in the Old Line state.